Pepping's name is more usually associated with sacred and organ music but in fact he set great store by his concert works. He was born in Duisburg in Germany and studied under a pupil of Schrecker, Walther Gmeindl, at the Berlin Academy (1922-28). During this period he wrote in an avant-garde style; a regular darling of the Donaueschingen Festival. 1929 saw him shift to choral writing and to a tradition that links with the Renaissance masters he admired so much. This became his centre of gravity during the 1930s. He returned to instrumental music in the late 1930s. As he did so he caught the ennui that surrounded the musical experimentation of the 1920s. All four works here return to traditional models; the concerto less so. The First Symphony is a cheery piece in a tradition reaching back to Goldmark's Rustic Wedding and in Pepping�s own times recalls the Huber symphonies (recorded on Sterling). Further back in time we might link the mood to Beethoven's Pastoral and Raff's late-period titled symphonies. Only in the Molto adagio do we hear intimations of a clouded sky. Here a trumpet solo reflects the gloomy coin represented by the anchoring sour elegy-solo in Franz Schmidt's contemporary Fourth Symphony. We may also hear a clod-hopping Mahlerian skirl in a third movement that skitters along in a Germanic echo of Moeran's Sinfonietta. The second movement material includes elements of hymnal writing that had me thinking of Nielsen's Sinfonia Espansiva. The Second Symphony was written during the dark days of 1942 and was premiered in Essen on 7 February 1943. Its long Molto sostenuto first movement is at first tragic and ominous with sombre fanfare-elegy-cortege material from the brass. Its progress is lumbering and sometimes ungainly but the binding elegiac theme transcends the gangly stride. It is heard discreetly at 5:58. Serenity in the violins returns for the Tranquillo which at times again glimpses the pages of Nielsen's Espansiva. The allegro spirituoso recalls the heartiness of Schmidt�s Hussarenlied Variations. The finale is gloomily and fugally serious with many an echo of Bach along the way. Fascinating that the trumpet solo plays such a part in these symphonies. Not only in the finale of No. 2 but also earlier on it is given eminence with some of the gestures refractively echoing the detonating fanfares of Mahler 5. Of these two symphonies the first is the more completely resolved. The second encompasses many moods. From the start one expects the eternal verities, tragedy and life and death. In fact the symphony lacks a coherence of mood while having plenty of impressive incidental moments especially in that glorious second movement. The First Symphony sets out to illustrate and entertain and does these things tolerably well; certainly enough to warrant revival. Onwards to the shorter second CD. The Third Symphony Die Tageszeiten dates from the penultimate year of the Third Reich. It is of about the same length as its predecessor. The standard four movements are entitled: Der Morgen; Der Tag; Der Abend; Die Nacht. It carries little of the charnel miasma of the time. If anything it represents a retreat from such matters. It is a symphonic companion to Pepping�s choral cycle Das Jahr (1940). In uncharitable hands there might be accusations of Pepping kow-towing to the Aryan ideals of manhood in the country's fields; the stability of wife and children, of sowing and harvest. Only in the finale Die Nacht is there an ominous edge although this dissipates in the face of Pepping's trademark happy disposition moderated again by the fugal character and treatment of the ideas. The Third Symphony was premiered in 1948 by Berlin Radio with Robert Heger conducting. 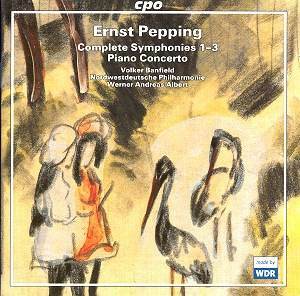 Pepping suffered some neglect as a composer who had stayed on inside Hitler's Germany but there was little lasting stigma. The notes say little or nothing about Pepping's relationship with the Nazi government. It would be interesting to know although it is irrelevant to appraisal of the music. The 1950 Piano Concerto is short and completely successful in its balance of ideas, treatment and duration. Unlike the three symphonies it is in only three movements. The premiere was by the pianist who made a name for himself by performing Furtwängler's Symphonic-Concerto, Eric Then-Bergh. The Berlin Phil were conducted by Joseph Keilberth on 16 September 1951. It does not ape the big symphonic concertos. It is all so much more concise, rapid-fire and even jazzy. After an exciting first movement there is a deeply poignant langsam with solo trumpet sounding across glistening serene writing for the strings. Pepping perhaps needed the tension of soloist against orchestra to strike alchemy. Certainly the results are adroit here. The finale Maestoso strikes the right note even if, with the benefit of hindsight, the brass fanfaring echoes the Quidditch music in the Harry Potter films. Volker Banfield gives this fine neglected concerto a good run for its money. Well worth hearing. The annotation is full and capable though it leaves historical questions unanswered. The performances seem completely engaged and well prepared. The sound is splendid at every turn. If you have a taste for German symphonies of the 1940s then do give this set a hearing. The symphonies have a tendency towards the discursive but this is not untoward if you prefer the illustrative and poetic to the grand and tragic. I found the First Symphony growing on me more with every hearing. However each of the three has treasurable moments. The Piano Concerto is an outright success and deserves to be heard much more widely.